Forty-one Bay Area organizations are undoubtedly celebrating this week after receiving the news that their organization was chosen to receive a grant from the Chan Zuckerberg Initiative Community Fund. The Chan Zuckerberg Initiative (CZI), made the grant announcement on its website on Wednesday, January 17, 2018. It was an announcement that many Bay Area nonprofits were eagerly awaiting. 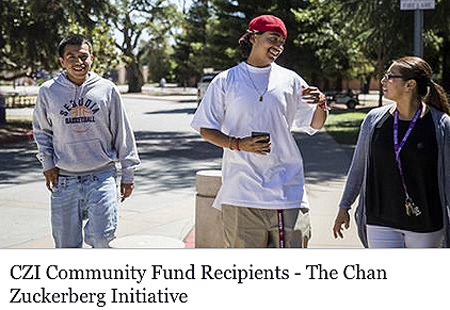 One of the grant recipients, the Foundation for a College Education sent an e-blast the day of the announcement stating that the organization is honored to be among the CZI Community Fund's 41 grant recipients. In announcing the very first grants given by the fund, Priscilla Chan, who founded CZI in December 2015 with her husband, Mark Zuckerberg, said, “The grants we are announcing today support 41 Bay Area organizations doing innovative, inspiring work to strengthen their communities, taking on some of the most pressing issues facing residents in Belle Haven, East Palo Alto, North Fair Oaks, and Redwood City. "We created the Community Fund at CZI to be able to respond to local community needs around education, housing, homelessness, immigration, transportation, and workforce development - priorities identified by local residents and groups as areas in need of greater support and investment. Twenty-two of the 41 grant recipients received grants of $25,000 - $50,000 and 19 organizations received grants of $51,000 - $100,000. All of the grants total $2,490,700 and they come from CZI’s Donor Advised Fund at the Silicon Valley Community Foundation. Six of the organizations receiving grants are listed as serving East Palo Alto exclusively: College Track, The East Palo Alto Academy Foundation, New Creation Home Ministries, The Rosalie Rendu Center, Spark and The Salvation Army East Palo Alto. Approximately, five of the organizations serve Belle Haven and East Palo Alto: Bayshore Christian Ministries, Belle Haven Community Development Fund, Girls to Women, Multicultural Counseling and Educational Services of the Bay Area and Vida Verde. Several organizations have offices located outside of the midpeninsula. Spark has an office in San Francisco. Hack the Hood is in Oakland and Vida Verde is in San Gregorio. Many of the grant recipients provide services to all four communities: Belle Haven, East Palo Alto, North Fair Oaks and Redwood City as well. While this round of grant awards by the CZI Community Fund impacts many local nonprofits, these are not the first grants CZI has given. Previous grants by CZI include support for local school districts including the Ravenswood City School District, the Sequoia Union School District and the Redwood City Schood District; community groups serving children and young adults, like the Boys & Girls Club; early childhood education programs like YMCA’s Nana y Yo program, Creative Montessori, All Five, 10 Books A Home and Family Connections; various community nonprofits like Magical Bridge Foundation, LifeMoves and the St. Francis Center; and organizations involved in addressing the issue of affordable housing, such as the Terner Center for Housing Innovation at UC Berkeley, TechEquity and Bay Area Forward. CZI is expected to make more grants from the Chan Zuckerberg Initiative Community Fund in the future. Reach the author of this article, Henrietta J. Burroughs, by email at epatoday@epatoday.org. See previous East Palo Alto Today article, New grant funding now available for nonprofits in four local communities, October 25, 2017.